There is a battle raging right now around the Australian church – and the church, generally, in the western world. That battle is about the truth, the veracity, the reliability and the holy authority of God’s Word. Many pastoral leaders and theologians are prepared to dilute, distort and downright reject parts of God’s Word with which they cannot agree because they deem it as “intolerant” or, “judgemental”, or “no longer valid for our culture,” or, (get this) “it’s offensive.” This is, of course, a demonically induced thinking. God’s Word comes to us in the book that we call the Bible and here, in the book, it tells us something about itself. It tells us three powerful things about its own character. First, God’s Word is “forever.” It’s eternal, it’s not temporary. It doesn’t change with fashions or the events of history or the attitudes and thoughts of man, or the ever-changing whims of culture. It’s forever – that’s an eternal word. Second, the Bible is “God’s word.” It’s not man’s word, or woman’s word or anyone else’s. It didn’t start with humans. It came from God. It’s the revelation of God himself – His ways, His thoughts, His attitudes, His purposes, His laws. Humans were the channels through which it came, but God was always the source, the inspiration. The third thing it tells us is that God’s Word is “settled in heaven.” Nothing that happens on earth can ever change the Word of God. It’s not subject to the decrees of kings or emperors, politicians, despots or dictators, or regimes and philosophical systems, nor is it subject to the opinions and views or the perverse, soulish opinions of so-called theologians who long ago walked away from a living faith in Jesus Christ. Neither is it subject to the violence of armies, or terrorists, or what you or I might think or prefer. 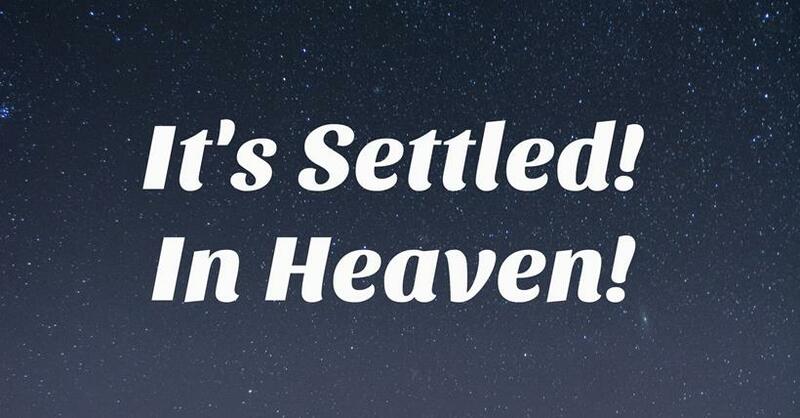 It’s out of reach of all evil and carnal forces; because it is settled forever – in heaven. And if it is settled there, no one here has any right, any authority to tamper with it here. It is settled in heaven, and thus, it is settled here. No argument. Make sure you read it every day!